News is that Steve Ballmer had just promoted Sinofsky to President — a title that Ballmer himself held for three years before becoming CEO. Unless Windows 8 is a failure, Steven Sinofsky will be the next CEO of the company. 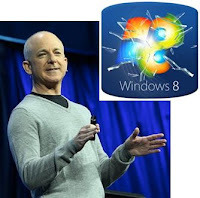 Microsoft's first consumer preview of Windows 8, something Steven Sinofsky has worked hard to produce, will give everybody a chance to see how it looks and works. Based on early demonstrations so far, it will be exactly what was promised — a completely different and much more approachable version of Windows. And it will come out exactly on time, later this year. That's a great news! Windows users are actually looking forward for this new version. I personally love the new UI of Windows 8.